This print was commissioned by Charles Briede, host of the Fellowship Of Fools podcast. Charles asked for 6 prints to be made. 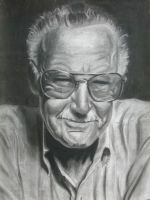 One of them was a “Stan Lee Proof ” which was given to Stan at the 2010 Emerald City Comic Con. The website at the top of the print is just a watermark and does not exist on the actual print. That's fantastic. I'm sure Stan loved it! I really like the classic-style colors in the BG. I especially like the background stuff. One thing though, if I didn't know what Stan Lee looked like, I'd assume the stylish gray-haired gentleman in the rose-colored glasses there was "Brian Denham," since that appears to be the caption. Or I'd think Brian Denham was Spider-Man. This is glorious. I hope Stan loved his copy!